currently under construction at Dufferin Street, Vaughan. The development is scheduled for completion in 2017. The Castles of King City has a total of 76 units. Sizes start at 5100 square feet. Seeking a new home with, well, everything? Your personalized castle on a 50’ lot is here, on a private enclave in King City. 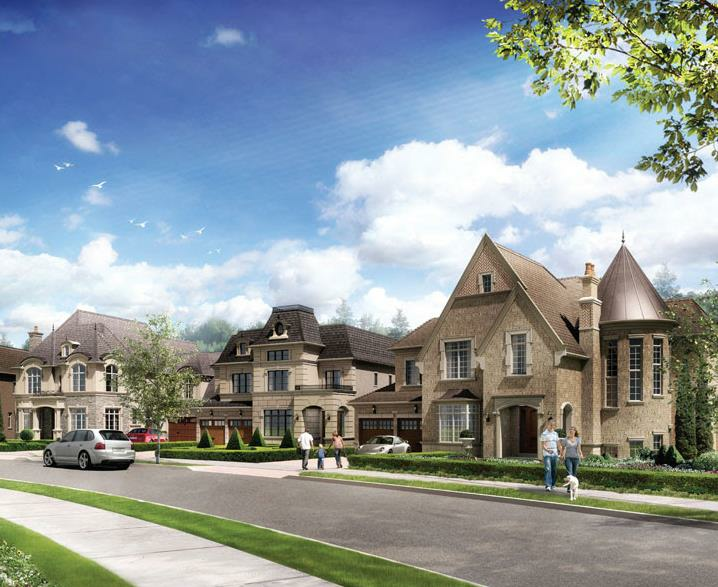 Discover our most luxurious homes yet. in select locations per elevation. 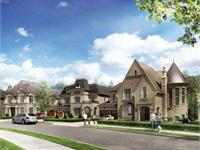 • Streetscapes with architecturally controlled exterior colour schemes, elevations, sitings and materials. arches per elevation. Coloured mortar and recessed masonry joints on front elevations for a refined finished look. • Gracious covered porches, charming balconies and porticos (as per plan). • Upgraded rear elevations to include additional windows, gables and precast accents (as per plan). 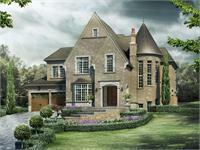 • Spacious garages with traditional Carriage style prefinished fibreglass garage doors. • Oversized and stained main entry fibreglass door system. • Extra thick and extra high reinforced poured concrete basement walls**. • Pre-cast concrete walks to front entries (where applicable). • Low maintenance aluminum or vinyl soffit, fascia, eavestrough and downspouts. • Two exterior water taps; one in garage and one in the rear (location to be determined by vendor). vendor may elect to install recessed lighting/exterior potlights if grade/site conditions do not allow for coach lights). • Self-sealing architectural shingles with a (limited life time) 30-year manufacturer’s warranty and/or metal roof (as per plan). • Fully sodded front, side, and rear yards including boulevards. • Fully drywalled and primed garage ideal for workshops. where there are raised, dropped or cathedral ceilings, beams or ductwork) as per plan. • Easy maintenance smooth ceilings throughout. (as per plan) with either wrought iron spindles or oak pickets (purchasers’ choice from Builder’s Standard Samples). • Closet organizer in Master Bedroom Walk-in closet with shelf tower (as per plan). Wire shelving installed in all other closets. • Reinforced concrete garage floor with grade beams. • Dropped ceilings and bulkheads over Kitchen cabinets and main Baths (where applicable). • Luxurious granite Kitchen countertops. • Island with base cabinets plus extended bar top (as per plan). • Stainless steel undermount sink with single lever Grohe faucet. • Convenient split electrical outlets at counter level for small appliances. • Heavy-duty wiring and outlet for stove and electrical outlet for refrigerator. ceilings) (where applicable). Cement base and 2" x 2" mosaic tile in white or bone to shower floor. 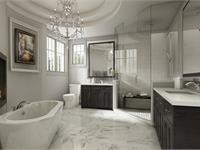 • Master Ensuite shower seats and shower jambs (Bianco Carrara or Perlato Royal) (as per plan). (excluding ceilings) or to shower enclosures (including ceilings). Cement base and 2" x 2" white or bone mosaic to shower floor. • Stunning Maxx freestanding soaker bath tub in Master Ensuite Bathroom (as per plan). • Grohe German engineered faucets. frosted as per applicable plans). • Striking Powder Room base cabinet with marble top, rectangular vessel sink and single lever faucet (as per plan). • Upgraded Grohe Chrome accessories in all Bathrooms. • Mirrors included in all Bathrooms and powder room. • Cement “Wonderboard” (36" high) on shower enclosure wall(s). • White ceramic plumbing fixtures. • Post formed arborite or formica counter tops (as per plan, except where noted above). • Energy Star exhaust fans in all Bathrooms. • Choice of quality Bathroom cabinets from Builder’s Standard Samples. • Convenient fiberglass laundry tub with separate drain and base cabinets (as per plan). • Hot and cold laundry taps for washer with heavy duty wiring for dryer. • Laundry room floors may be sunken to accommodate entry door(s) in laundry (if required). • Upper laundry cabinets in white as per applicable plan. and open to below basement foyers (as per plan). • 12" x 12" or 13" x 13" ceramic tiles to laundry rooms, mud rooms and other bathrooms (as per plan). from Builder’s Standard Samples (to finished areas, except tiled areas as per plan). Your inquiry will be delivered to the developer / builder of The Castles of King City, who will send you more information about this development.